Cation Mixed Bed Color Changing Resin can be used with any type of RO/DI system that utilizes refillable cartridges, and is great at removing calcium, magnesium, aluminum, iron, and other positively charged ions. 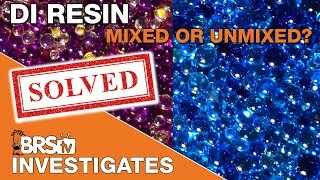 Mixed bed DI resins accomplish the exact same task by removing contaminants and delivering 0 TDS water, but depending on contaminants in your water you may want a cation or anion color changing resin for the best results and efficiency! Reverse osmosis systems can remove up to 99% of contaminants from your water, however, they can never remove 100% which is the overall goal for reef tank water. That is where deionization (DI) resin comes into play, by taking place as the last "filter" of a RODI system after the membrane. 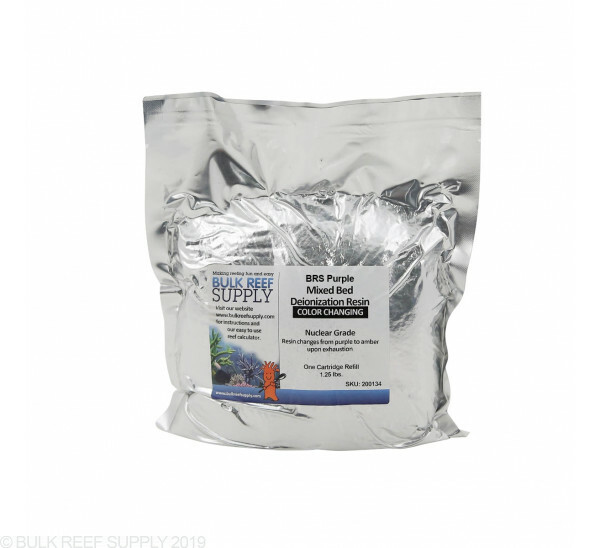 DI resin is ionically charged as either a cation (+) or anion (-) to exchange hydrogen or hydroxide molecules for contaminants like phosphate, silica, nitrate, sulfate, aluminum, iron, calcium, etc allowing you to achieve 0 TDS water for your aquarium and help eliminate any possible water quality issues. You may or may not know that there are multiple types of DI resin available from mixed bed to single bed resins that you can use depending on what the specific goal is for your water and what is in the water after the RO membrane. Single bed DI resins come in many different flavors, but at heart only contain a single cation or anion that makes up the entire media bed. 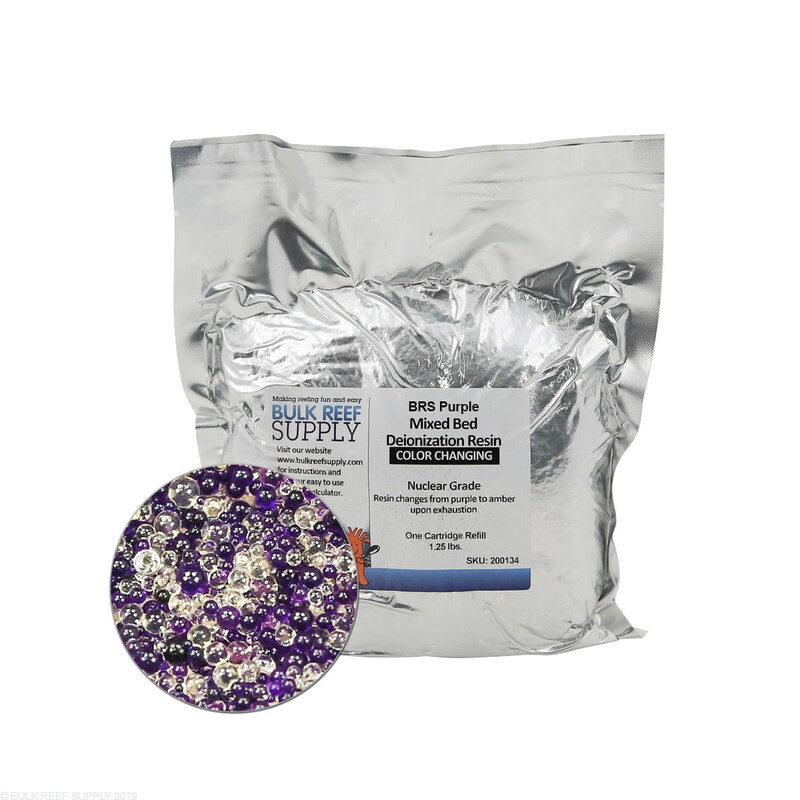 Single bed resins are commonly used in household water softeners and other applications that require either the positive or negative ion to be removed and exchanged for hydrogen or hydroxide ions. The concentration of a single bed lets you focus on specific issues that you may have with your water without wasting extra resin like a mixed bed resins. Mixed bed resins contain both cations and anions in a single bed of media that will remove both positively and negatively charged ions from the water column. Mixed beds are very common in residential RODI system that is used for reef tanks and other types of aquariums since they are easy to use, but when it comes to efficiency and cost savings, single bed systems are the clear winners. Choosing a single or mixed bed resin can be hard especially if you do not know exactly what is in your water or how a RO membrane will filter it. In most cases, you can use either the cation or anion mixed bed resins but may notice that a TDS meter is showing that the resin is exhausted before the color has changed completely. That is more than likely due to an excess of the opposite type of ion in your water when compared to the color changing dye used in that resin. 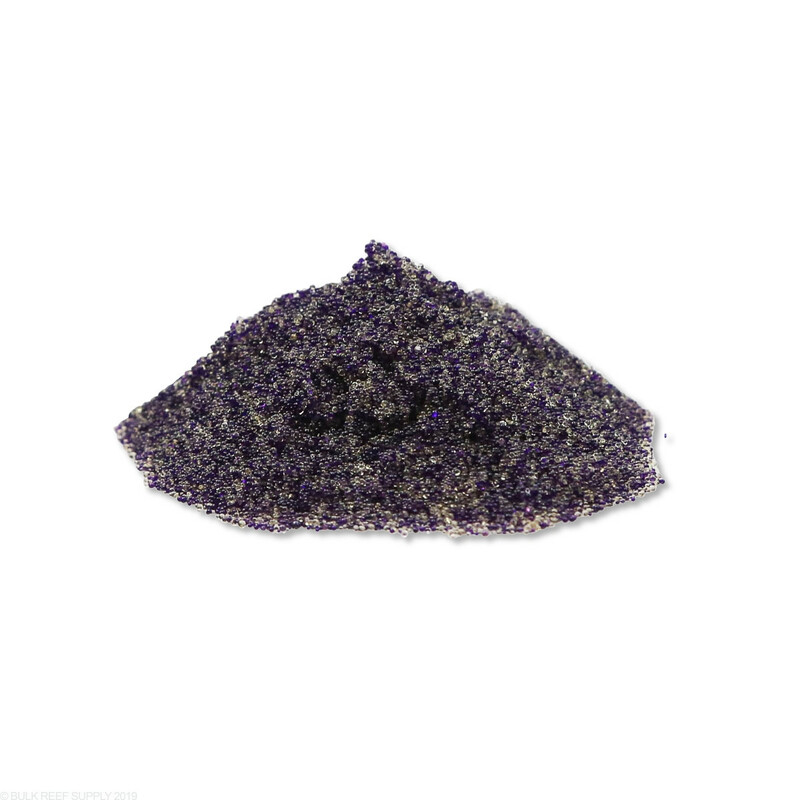 Mixed Bed Cation Resin (purple) - Most commonly used after single bed resins to polish any remaining contaminants. It contains both positive and negatively charged ions and will change from purple to amber as the cation resin is depleted. It is also perfect for single canister DI systems that have an excess of positively charged ions like calcium, magnesium, aluminum, ferrous and ferric iron. Mixed Bed Anion Resin (blue) - The most commonly used resin in single or dual canister RODI systems and contains both negative and positively charged. The anion beads contain a blue color changing indicator that will turn to an amber color when it is exhausted. 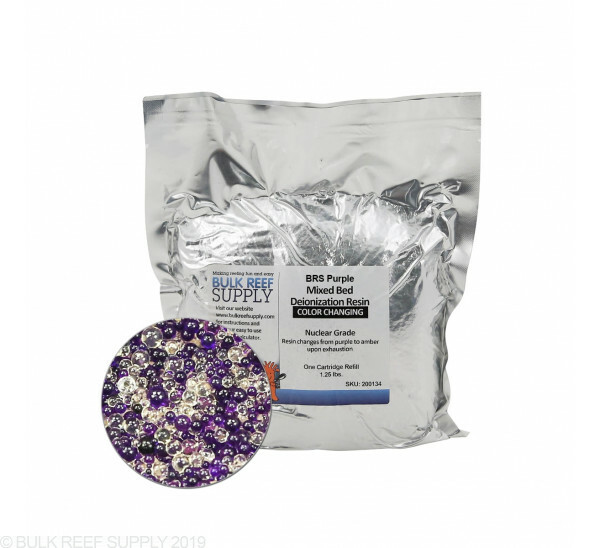 This resin is excellent for systems that have an excess of negatively charged ions that are not removed by the membrane, like phosphates, nitrates, sulfates, etc. 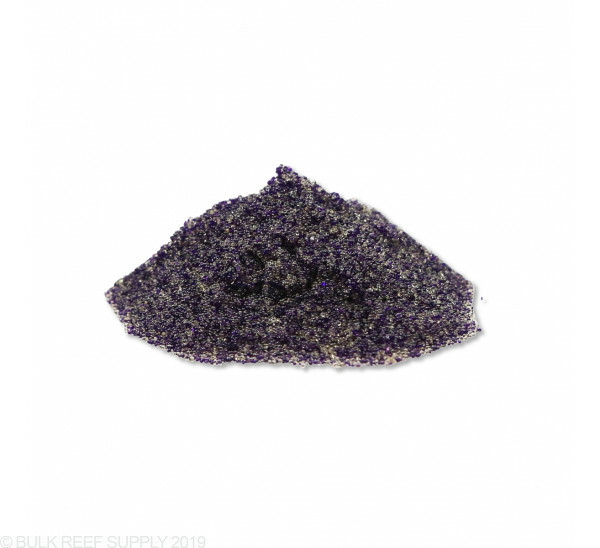 Single Bed Cation Resin (purple) - Contains only cation beads that focus on removing positively charged ions from the water that passes through it. As the resin becomes depleted it will change from a purple to amber letting you know at a glance when it is depleted. This is most commonly used as the first stage in a single bed DI system. Single Bed Anion Resin (blue) - Anion resin focuses on removing negatively charged ions and has a blue color changing dye that will change to amber as it becomes depleted. Single bed anion resin is commonly used as the second stage in a single bed DI system. 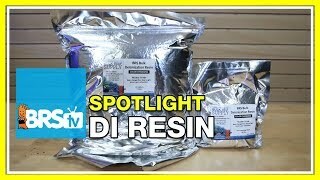 BulkReefSupply.com takes pride in the proper packing of our DI Resin. DI resin begins depleting when exposed to air. To avoid this, we package all of our DI resin in foil-lined 4mm Mylar bags AND vacuum seal it so no air is left in the package to deplete the resin while it is waiting to be used. Our resin can remain packaged this way for 2 years without losing its capacity. 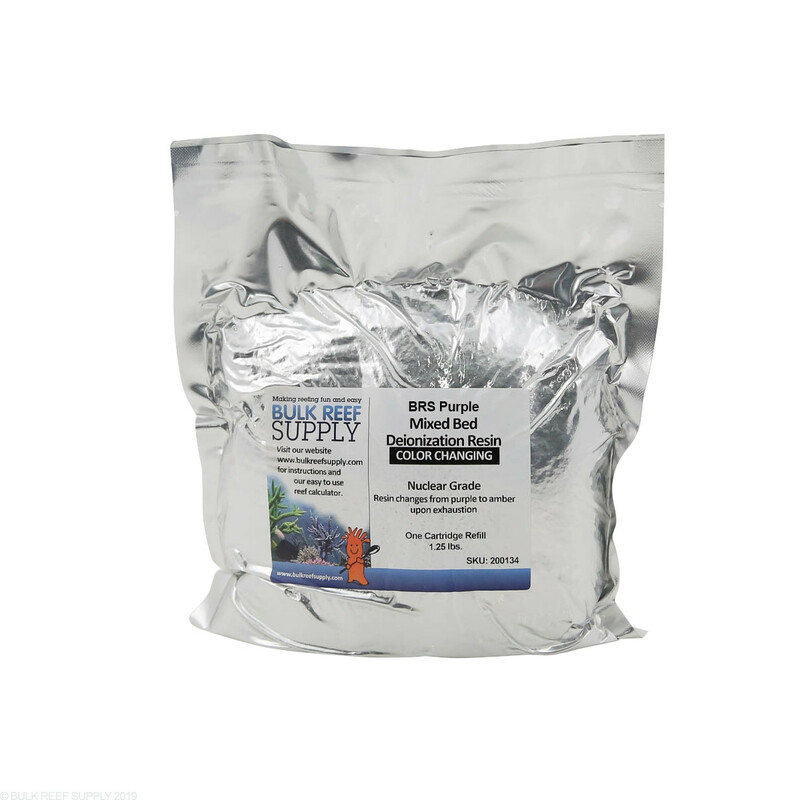 Our bulk DI bags are perfect for reefers who process a lot of water or otherwise go through resin quickly. Keep in mind once the vacuum seal is opened the resin can start to deplete. Otherwise, purchase the single refill packs for optimal freshness up to two years. Resin works as advertised; just run a half gallon of output water into a waste container as resin gives off some dye initially. Have had a few of these. Poor performance. Should make considerably more. TDS from well water tap only at 140-150 TDS to start. Going into color changing resin already brought down to 8-10 with fresh carbon etc filters. Brings RODI coming out to 0 as it should initially. But in less than 40-60 gallons resin has changed color to about 50-60% up the canister. TDS coming out at 2-4. By <80-100 gallons of produced RODI it is fully depleted and yellow resin color only in canister and tds runs non better than 4. TDS creep occurs and climbs to 6-8-10 over the next 40-80 gallons. With this starting tds should be able to produce 1000-2000 gallons at least. Not happy with this performance. Bought this to replace melevs reef di cartridge that only made about 110 gallons.. so far the BRS resin has made 230 gallons and still going! It also come with more than you need! Buy it! If I'm using the dual di reactor, what is the best combo to use. Should I just fill both mixed anion resin or have cation in one and anion I another? We have found the best combo to remove unwanted elements has been using a single bed anion resin and then a mixed bed cation resin.